It was an idea born out of tragedy and nurtured by a passion for swimming. When a close friend of UBC swimmers, Hayley Pipher, drowned two years ago she began thinking about ways the accident could have been avoided. Felix Riaga Odera, a 24-year-old University of British Columbia student, died after leaping into the water at Kawkawa Lake near Hope, B.C. RCMP say the native of Kenya couldn't swim. "I went to the funeral, I saw his mom," the 20-year-old Pipher said in a recent interview. "Probably the part that was so devastating for me is how avoidable it was. It was something that didn't need to happen." The UBC student, who is an executive with the university's Africa Awareness Initiative, came up with the idea of offering swim lessons to African students who are uncomfortable in the water. A former varsity swimmer, she enlisted the help of several members of the UBC Thunderbird swim team, including Olympians Savannah King, Tera Van Beilen and Heather MacLean. "It's really great to be able to give back and to use what we've learned over the years and help other people and teach other people to prevent drowning incidents," said King, a two-time Olympian. 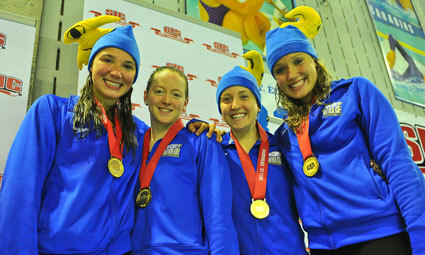 Also acting as instructors are Thunderbird swimmers Laura Thompson, Patrick Cowan, Colleen Nesbitt and Rebecca Terejko. So far, nine students from Africa have signed up for the lessons. Pipher is careful not to create stereotypes. "It doesn't mean all African students can't swim," she said. Hassan Yaro, a native of Somalia, was one of three people attending a Thursday evening lesson at the UBC Aquatic Centre. Yaro explained he "had some experience in swimming" but just wasn't very good at it. "I just wanted the experience so I can be a better swimmer," he said. "I was excited." Mohamed Abdi of Kenya said the lessons were his first time swimming. "I know swimming is a life skill," he said. "You can improve your life. I got this opportunity. I decided to do it." Pipher said the lessons are not intended to produce Olympic-calibre athletes. "We give lots of one-on-one attention. We really tailored it to each person's needs. Even within the group there are variations. Somebody might have a difficult time just breathing, where some of the other guys are totally fine but they are still not quite comfortable by themselves." Thompson is a fourth-year student majoring in political science and minoring in economics. Besides competitive swimming, she helped build houses last May on a Habitat for Humanity trip in El Salvador. Thompson has taught adults swimming before but found some differences when dealing with people from a different culture and background. "One of the things was temperature," she said. "No one has ever had a problem with that. One girl was so cold because of the temperature of the water. "We spent a lot of time just toes in, toes out. It was slow going. The best part is having fun. They really enjoy it, we enjoy it." Cowan, a friend of Pipher's, said after years of receiving coaching and training it felt good to pass on the knowledge he's gained. "We have all this expertise gained through the years," he said. "Why not try to help people who never had coaching, never learned how to swim. "It makes me appreciate how I have been given this opportunity to impart my knowledge to somebody else that needs it." King considers swimming "almost a fundamental of life." "Most of the world is made up of water," she said. "Learning is something you need in your life. "If you get into a water situation you need to have that skill and not be afraid of the water. I know a lot of people are afraid to even get into the water. You need to develop that comfort so when you are in situation that has the need for you to swim, you will be able to do it." Standing on the pool deck watching the lessons, Pipher said it's sometimes difficult to judge who is benefiting the most from the experience. "It's just been really uplifting," she said. "The last time I was looking at them and it's so cool to see this bridge of demographics, swimmers hanging out with people they wouldn't normally hang out with. "I think it's kind of opened some of the varsity swimmers' eyes a little bit. They are on the best team in Canada. It's not a privilege just to be talented. It's a privilege just to know how to swim. It's been really rewarding in that sense."